Most of my financial planning clients feel strongly that they are willing to forgo present consumption for the sake of future consumption i.e. they are willing to make sacrifices now to ensure a financially secure retirement for themselves in the future. However, a few have no desire to make this sacrifice and simply don’t feel that their future selves should in any way determine how they should act today. Now, it’s only too easy to criticize this latter view as being selfish and short-sighted, but I want to suggest that it may have more to do with their understanding of what constitutes the ‘self’. If you believe in a unified concept of the self (see my recent post: The Importance of Getting Lost) that endures over time, where the future is as equally a part of you as the present, then it makes sense to criticize any neglect of your future self. On the other hand, if you deny the existence of a single entity persisting over time and think of the ‘self’ as being more a series of overlapping selves connected by memories and similarities of character and interests, then it makes sense that you might feel more separate from your future self than, say, from another person. This suggests the possibility that it might indeed be rational to neglect one’s future self in favor of one’s current self. If you doubt this reflect for a moment on the nature of procrastination. Does this not involve imposing a burden on your future self that you don’t want to impose on your current self? If you repeatedly procrastinate does it not say something about how you regard your future self, that you are consistently willing to impose burdens on him or her rather than impose them on your current self? This suggests that our relationship with our future selves is not all that different from our relationship with other human beings. The solution to treating others badly is to develop empathy, putting oneself in the shoes of another. Perhaps we can use the same technique to solve the problem of procrastination, by putting ourselves in the shoes of our future self and convincing ourselves that our future self is just as much in need of care and concern as our present self? ← Are We Just Naked Apes? I admittedly and somewhat abashedly confess to being a procrastinator. I guess I’m not that kind to myself. I like to work myself up into a ball of acid stress. I work better under pressure. Great thought provoking post as usual Malcolm. All those beautiful Haiku from “a ball of acid stress”. The mystery of the creative muse indeed. Well, on one hand, I do not believe in some unified, unchanging self, but what you call, “a series of overlapping selves connected by memories and similarities of character and interests.” Or as Buddhists see it, an impermanent collection of aggregates upon which a self is imputed, but has no inherent existence. However, I’m quite cognizent of planning for the future. There’s ultimate truth and relative truth, and my impermanent, dependently arisen self likes being living under a roof that doesn’t leak, having enough to eat, and being able to afford an internet connection. Morgan, thank you for this great comment. The argument that however distant and strange my future self, it’s still me in some way who is going to feel pain and discomfort in the future, is, in my opinion the strongest argument against the concept of overlapping selves. You seem to have found a way around this by using the concepts of ultimate and relative truth. Sounds like a deeper conversation for another day. I nurture and nourish both. It’s mutual appreciation and recognition of the now and the to come. Eric, thank you. I am happy you seem to have found the perfect balance. reminds me of something…… but I maybe wrong. But I always think of my future self, without disregarding for a moment my present self. It’s good. Yes, it is good. What a well-balanced readership this blog has! Thank you. I’m glad to hear that someone else experiences these very normal behaviors. I suspect that vacillating between extremes in this way is much more common than most people realize. I blame my past self, at some points, for being short-sighted, and thus causing grief to my present self. Of course, there are instances where I couldn’t have known that it was a bad idea when I was doing it, but just as often as I could have known it. Since my present self is my future past self, which I don’t want to put more blame on, which is proportional to the grief my future self will experience, I do try to plan ahead and evenly spread the boons I am granted. NicoLite, I am glad you have also found a harmonious balance. It isn’t easy. Jan, thank you. I’m sure fear is often a factor. For example, should I take an early distribution from my retirement fund to help start a new business? Fear of not having enough money for retirement in the future has to be balanced against the advantage of being able to follow a dream now and start a business. It’s never an easy trade-off. Very interesting question at the end of your post, especially since that’s how I tend to operate. I often find delayed gratification effortless when I imagine my future self benefitting from choices I made in the past (no need to dress in multiple layers when I’m 75 or 80 – I saved enough to ensure I could afford to heat my house in old age…) But some people seem to be hardwired quite differently. Most, in fact, appear to have a much higher “discount rate” when it comes to the present vs. future value of “gratification” or happiness. I like thinking in this way about procrastination and our future selves. I’m going to try to weave your idea into the next conversation I have with my college age son (Mr. last minute). Well said. We all need to be reminded of this from time to time. Your future self would say that, wouldn’t he? Michele, thank you for these kind words. Only M Greenhill could come up with a paradigm transfer like this. Nice job. HW, please hug yourself with delight for having beaten me to this one. I must admit that when I first read your comment I thought that you had confused The Confessions of Max Tivoli with The Curious Case of Benjamin Button, the story by F. Scott Fitzgerald, which was also made into a film. However on researching this it seems that Mr. Greer claims that he had no knowledge of the Scott Fitzgerald story when he wrote his own, and he says the two stories are completely different. “Greer has a way of describing the moment “bouquet of cigar smoke” I imagine you would take to. I thought the concept of a life swimming countercurrent to the world would intrigue you. Congratulate myself I will. My husband was reminded of B Button when I told him about this one. Tivoli’s making his way in “a time-twisted body” is actually incidental to the story of one navigating the vicissitudes of love in this predicament. “The smell of butter and cream, the bowl like a girl’s head of golden curls – a dreamworld of memories.” I covet Greer’s artistry. Enjoy! You don’t need to covet anyone’s artistry HW. I will read Greer after I have learned to move with FK, stand with the Alexander Technique and talk like James Joyce. How much do you charge for time management lessons? On your recommendation I will read Greer now. Very neat. I banked on my record, with Born to Run and Cleopatra both home runs. You might go ahead with your own post on this one. I’ve been hard pressed to find the time for the next post…which happens to be on (that is, about) time and hadn’t really planned on weaving Tivoli into. Thanks Bonnie. I’m glad you enjoyed it. Exactly right, Andreas. However, whether or not it will be the same self it will still be you that suffers the pain and hunger of destitution when you run out of money. As I am European, “pain and hunger of destitution” are not a very likely experience in old age. All EU countries (except Greece, I believe) have some minimum retirement income that one will receive regardless of the contributions made into the system. Andreas, I appreciate your follow-up comment but most European countries have the same problem as the U.S. i.e. they have promised much more than they can deliver. There is no way that all the obligations made by these governments can be honored and so, sooner or later, they will default on some of these obligations. Personally I think that they when they default they should choose to default on bond holders, who at least took on some risk. Recipients of social security retirement benefits did not assume any risk. However, I certainly would not want to rely on governments to make the ‘right’ choice. Given the history of the last decades if not centuries, I’ll trust the retirement system of a democratic state (i.e. a state relying on the votes of its increasingly older voters) much more than that run by a bank or a broker or an insurance company. A lot of people are poor because they trusted some investment advisors or salesperson at a bank; a social security cheque has never been late. Andreas, I would not be so quick to use the experience of history. The definitive account of credit crises is the book by Carmen Reinhart and Kenneth Rogoff, This Time It’s Different: Eight Centuries of Financial Folly. These crises always end with one form of default of another. Reinhart and Rogoff document the default(s) of virtually every country in the developed and developing world including the United States. The U.S. defaulted on its debt in 1812, after the Civil War (if one counts the default on confederacy debt) and 1933 if one includes the abrogation of the gold clause. An interesting perspective on a subject close to my heart. 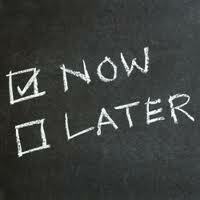 Procrastination – it’s the one thing I can’t put off until tomorrow. Oh dear, I think I fall into a lost cause category! I have no financial plan for my future and ensuing old age. I never liked to work in once place long enough to consider in-work pensions, and learnt private pensions required huge financial monthly payments to make them worthwhile. I suppose living in today’s world I chose not to sacrifice the now for a future I couldn’t predict. Well, I can predict one thing, I will be very poor and possibly destitute! Yet, perhaps I have decided to accept my old age in that state, rather than being that way in my ‘youth’. I never felt in a position to be able to have everything I required financially, including pensions and so on, and actually always prefered an instant gratification, rather than thinking of the long term incentive. I suppose if I had thought it through more carefully I would have been more savvy, ironically! Bex, there is no need to feel regrets. I’ve seen plenty of people save diligently for their old age and die before they had a chance to spend a penny. I’ve also seen plenty of people without the proverbial “pot to pee in” who are very happy with their life. Attitude is everything. Yes indeed. I always hope I will have just enough to get by unscathed, as I am not greedy! Ahhh, very true Malcolm, as I actually do think that my families history, and ethos influenced or reinforced my desire not to save. Seeing their examples proved that saving, pensions and deferring things to an old age, just doesn’t always go to as planned.